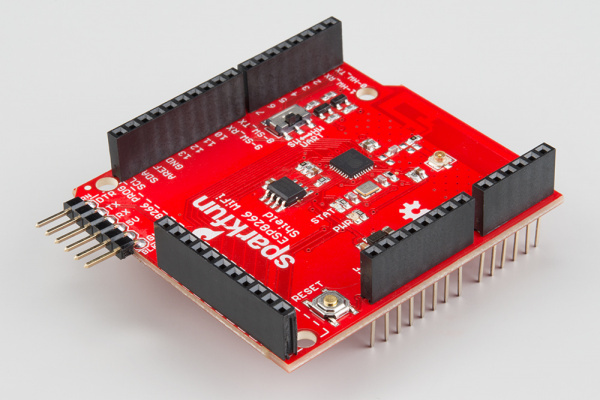 The ESP8266 is a popular, inexpensive WiFi/microcontroller system-on-chip (SoC). Although it can be programmed like any microcontroller, the ESP8266's popularity was gained as a simple, serially-controlled WiFi gateway. 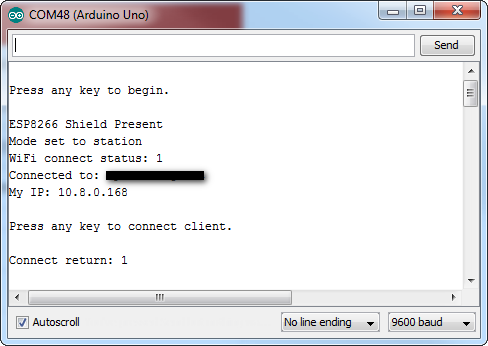 Using an AT command set, any microcontroller with a UART can use the ESP8266 to connect to WiFi networks, and interact with the rest of the Internet world over TCP or UDP. It's an easy (and cheap!) way to get your Arduino on the Internet! 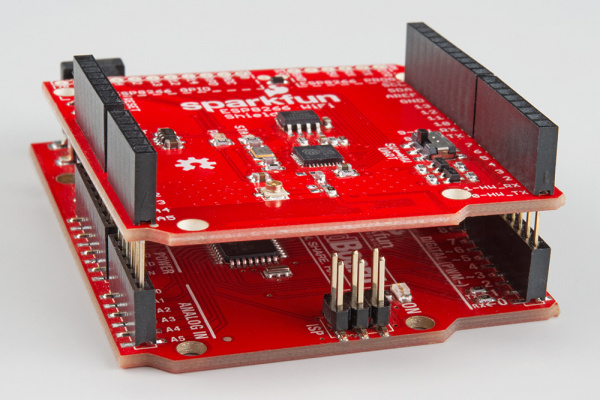 There are a variety of designs based around the ESP8266, including tiny, modular boards and more accessible development boards like the SparkFun ESP8266 Thing. 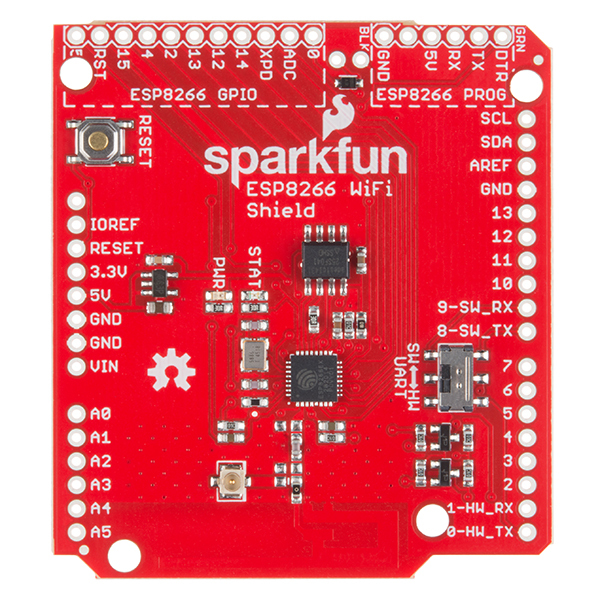 The ESP8266 WiFi Shield finds a middle ground between the Module and the Thing -- it comes pre-flashed with an AT-command firmware, so it can be controlled by any UART, but it also breaks out and provides command access to all of the ESP8266's I/O. It comes in the familiar Arduino Shield shape, and should work with any similarly-sized Arduino-compatible development board out there. Whether you want an introduction to the ESP8266 -- without leaving the comfortable hardware confines of your Arduino -- or you just have a back-stock of Arduino's that need an inexpensive gateway to the Internet, the ESP8266 WiFi Shield may meet your needs. Hardware Overview -- The main components and hardware features of the Shield are covered in this section. AT Firmware Overview -- Documentation links, and a quick introduction to the firmware running on the ESP8266 WiFi Shield. Hardware Assembly -- Tips and tricks for assembling your WiFi Shield. Installing the ESP8266 AT Library -- Everything you should need to install the ESP8266 AT Arduino library. Using the ESP8266 AT Library -- Pointers to help get you started writing an ESP8266 Arduino sketch of your own. (Re-)Programming the ESP8266 -- Take the ESP8266 WiFi Shield further by loading your own code onto the shield! The ESP8266 is even Arduino compatible. 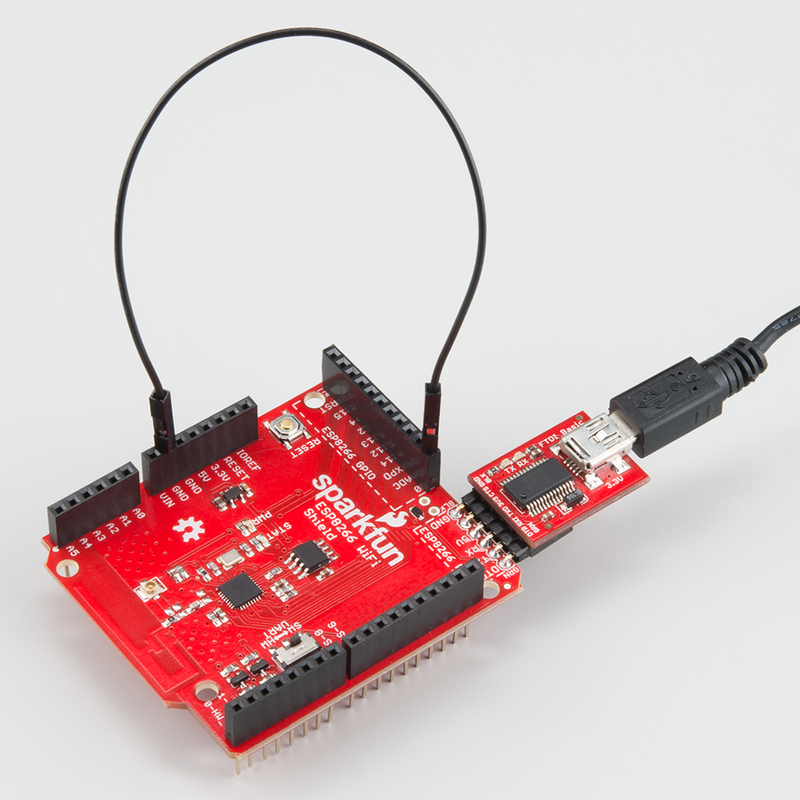 Instead of the RedBoard, you should be able to use almost any other Arduino-compatible development board -- the Uno or Leonardo for example. You'll also need a set of soldering tools, if you don't already have them. A simple iron and some solder should really be all you need. What is an Arduino? -- What is this 'Arduino' thing anyway? Arduino Shields -- All things Arduino Shields. What they are and how to assemble them. Serial Communication -- Asynchronous serial communication concepts: packets, signal levels, baud rates, UARTs and more! How to Solder - Through-hole Soldering -- Are you new to electronics and soldering? Have you soldered before but need a refresher? Do you solder all day everyday but still feel you could use a few tips and tricks? 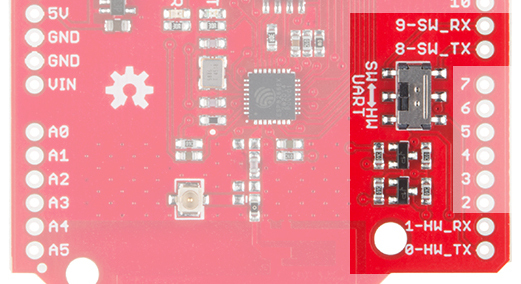 This tutorial with cover everything you need to know about through-hole soldering. There are a couple features you should be familiar with, before equipping the Shield with headers and plopping it on you Arduino. 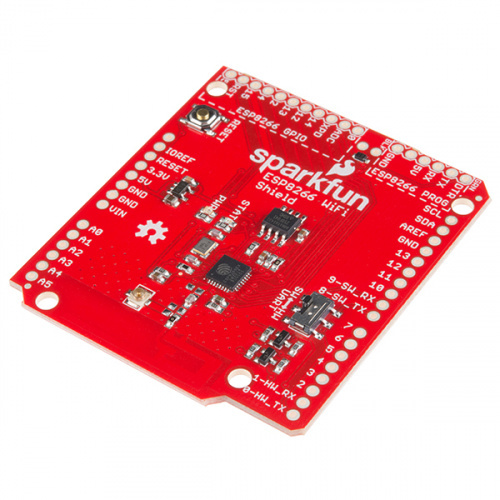 The ESP8266 WiFi Shield features selectable serial lines, which route the RX and TX signals to either the Arduino's devoted hardware serial port (on pins 0 and 1), or a software serial port on pins 8 and 9. The active port is selected by the on-board switch. The switch's positions are labeled "SW" and "HW" for "software" and "hardware"; they should be intuitive -- slide towards the hardware port for "HW" and towards pins 8 and 9 for "SW". Watch out! When you're programming your Arduino (assuming it's an ATmeg328P-based 'duino), make sure the UART select switch is slid over towards the "SW" position. If it's set to "HW", all of those bits and bytes being programmed into the Arduino will also be sent over towards the ESP8266 — there's a chance the spurious data might put the ESP8266 into an unknown (though recoverable) state. The ESP8266's default baud rate is set to 9600, so, for most sketches, software serial works fine, and allows the hardware port to be used for debugging. We recommend keeping this switch set to "SW" unless you need those pins for something else, or just have to use hardware serial. It's also important to note that the ESP8266's maximum input voltage is about 3.3V. To avoid any voltage conflict between a 5V Arduino and the ESP8266, the RX and TX signals are level shifted between 5V and 3.3V. The shield's reset button is tied only to the Arduino. Pressing and releasing the button will restart the Arduino, running it's sketch from the top of the setup() function. Pressing the reset button will have no immediate effect on the ESP8266. The WiFi Shield includes two LED indicators: a simple red power indicator and a blue "status" LED. The red power LED should illuminate whenever power is being delivered from the Arduino to the ESP8266 Shield. If you need to debug anything, checking for this LED should be your first step. The blue status LED is tied into the firmware of the ESP8266. It'll blink, be solid, or turn off depending on which state it's in. Off WiFi disconnected. Not configured. Blinking Station mode: ESP8266 attempting to connect to access point. On Station mode: ESP8266 connected to access point. AP mode: Devices connected to ESP8266 AP. The status LED is tied to GPIO 5 of the ESP8266. The ESP8266 is a much more than a simple serial-to-WiFi gateway. It's has almost a dozen I/O that can be configured as digital inputs or outputs -- it even has a (relatively limited) ADC! These GPIO are all broken out towards the top-left side of the shield. The shield's firmware is equipped with custom commands, which allow your Arduino to set, write, and read to these pins. More on that later. The ESP8266 WiFi Shield can also be repurposed and reprogrammed through the programming port. Whether you want to add AT commands of your own, or flash custom firmware on the ESP8266, this port may come in very handy later on. The pinout of the programming port matches our FTDI Basic breakouts. Solder on some male headers, and mate the two boards together to set up the programming interface. More on that later too! While the hardware is obviously important, what really makes the WiFi Shield play nicely with an Arduino is its serial-based AT command-set firmware. The ESP8266 WiFi Shield ships with Espressif's (the manufacturer of the ESP8266) latest release of their AT command set firmware. We've tweaked the base firmware to add support for the status LED and serial control of the ESP8266's unused I/O. Our firmware is as open source as can be (some of Espressif's source is only available as blobs) -- you can check it out in our ESP8266 WiFi Shield GitHub repository. In later parts of this tutorial, we'll introduce an Arduino library, which handles all of this "AT" stuff for you. But it doesn't hurt to at least familiarize yourself with the commands used to configure the ESP8266. The ESP8266's default serial baud rate is 9600 bps. This communication speed can be configured, but slower speeds are recommended if software serial is used. For the full list of the ESP8266's AT commands check out this document. There are a variety of commands, which configure everything from access-point names/passwords, to TCP connections, to the device's baud rate. 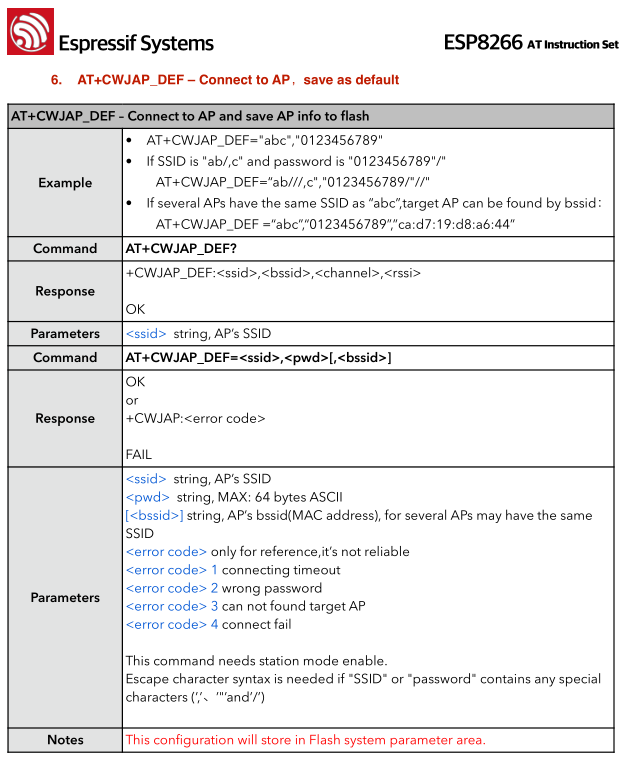 Example page from the AT command set guide -- this one demonstrates how to connect to a WiFi access point. If you're manually entering these commands, keep in mind that the end of each command should be signaled by a carriage return then line feed ("\r\n"). We've taken Espressif's AT command firmware and added a few additional functions which give you control over the ESP8266's unused digital GPIO. 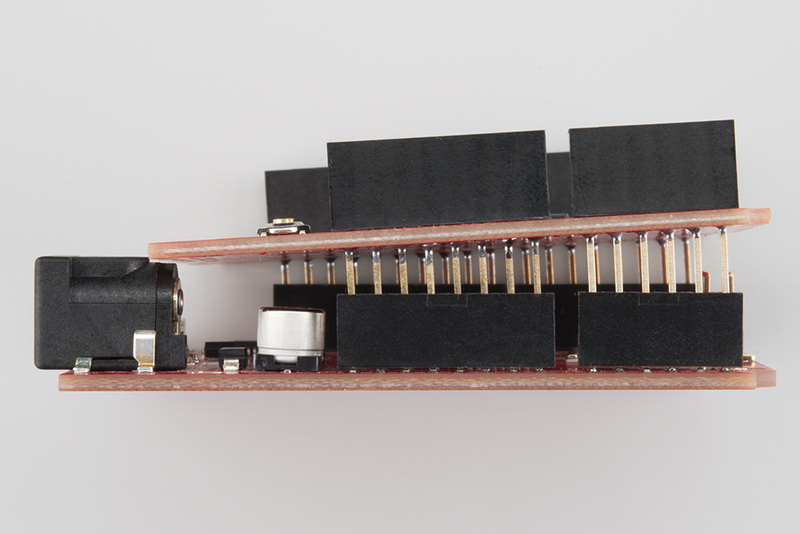 In all, there are 9 GPIO to be digitally controlled: 0, 2, 4, 5, 12, 13, 14, 15, and 16 (XPD). Digital Read AT+PINREAD=<pin> AT+PINREAD=0 Response: 0 or 1 for LOW or HIGH. Before you can use the ESP8266 Shield, you'll need to solder a few headers in so it can interface with your Arduino. Stackable headers are always a good option for shields, especially if you plan on stacking more shields or plugging in jumper wires. You can also opt for the more form-factor-friendly male headers, if stacking isn't as important to you. Depending on how you'll use the shield, you can also solder headers into the ESP8266 GPIO and program headers. The programming header can interfere with the bigger USB-B connectors on Arduino Uno's, so keep their clearance in mind when you're soldering them in. Female headers can be a good choice for the GPIO header, while right angle male headers make it easy to interface the programming headers with an FTDI breakout. Unfortunately, the ESP8266 WiFi Shield's printed PCB antenna can potentially run into interference problems with Arduino ISP headers. After seating the shield on your Arduino, you may want to slightly nudge the shield up, to avoid bumping the board against the 2x3 ISP header. The header can interfere with the Shield's WiFi signal, and lead to lower-than-expected signal sensitivity. If your shield is having trouble connecting to a network, make sure there's some clearance here. Let's get to programming! To make interfacing with the shield's AT command set as painless as possible, we've written a simple Arduino library. You can get the library from our GitHub repository, or download it by clicking the button below. 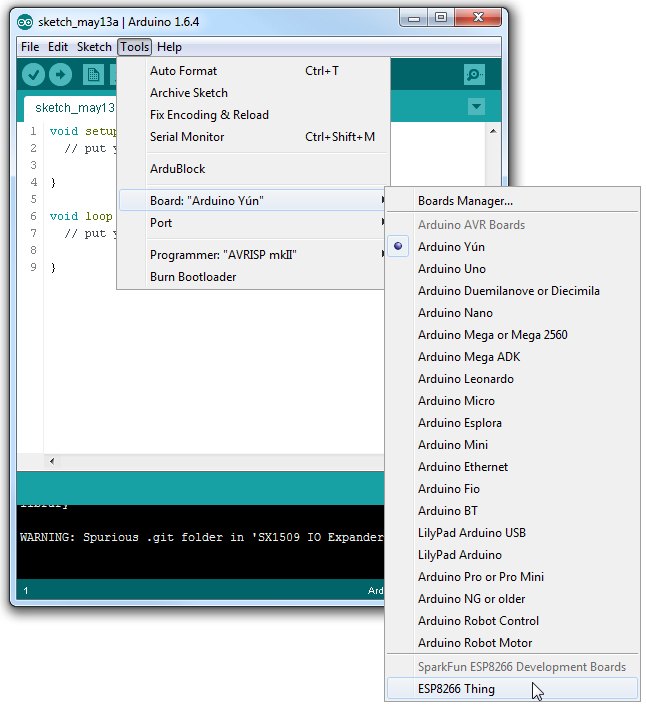 We recommend using the latest version of Arduino with this library (currently 1.6.5). For help installing the library check out our Installing an Arduino Library tutorial. 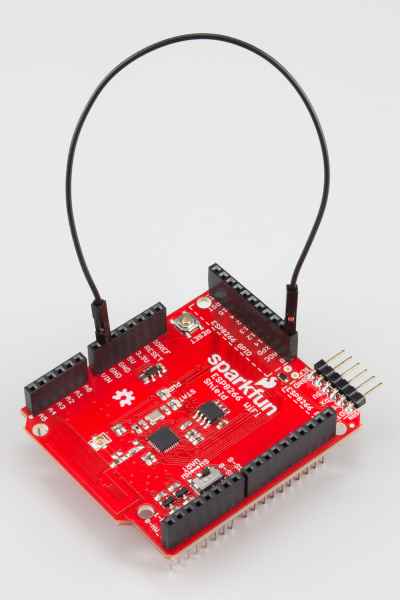 The SparkFun ESP8266 AT library includes a handful of example sketches, they demonstrate everything from connecting to an access point, to serving up a webpage, to setting up a chat server. To test everything out, load up the "ESP8266_Shield_Demo" example, by going to File > Examples > SparkFun ESP8266 AT > ESP8266_Shield_Demo. To configure the ESP8266 for your local WiFi network, you'll need to modify a pair of strings, near the top of the sketch. Lastly, before uploading the sketch, make sure the UART switch is set to SW -- it should always be in this state whenever you upload something new. After verifying the switch is in the correct position, upload away! This example runs through some of the foundational functions of the ESP8266 AT library. It connects to an AP, finds it's local IP address, tries to connect to a remote server (example.com) to get a webpage, and finally sets up a server of it's own. Opening up the serial monitor (set to 9600 baud), and following along with the instructions (you'll need to send a few characters to trigger events), will keep you informed on how the Shield is working. You will need to be on the same network for this to work. The example from the previous section -- and the others included with the library -- should go a long way towards demonstrating the usage of the SparkFun ESP8266 AT library. This section will document some of the more commonly-used functions. For more documentation check out the library's GitHub repository. In your setup(), to initialize the ESP8266 and make sure it's functioning, call esp8266.begin(). This function will return either true or false, indicating if communication was successful with the ESP8266. esp8266.begin() must be called before any other ESP8266 function. The connect() function will also return a value, indicating it's success. Any value greater than 0 indicates success. Any value less than 0 means there was some trouble connecting. This function can take some time to complete -- the timeout in the library is set to 30 seconds. 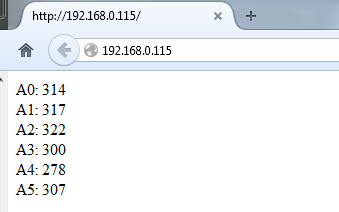 After connecting, you can check your local IP address by calling esp8266.localIP(). This function will return a variable of type IPAddress. Once the client is created, you can call the connect() member function to connect to a destination server. This function requires two parameters: a destination server (IPAddress or String) and a destination port. connect() will return a number greater than 0 on success, and a negative value if it fails. Finally, to close a client connection, call client.stop(). The ESP8266 AT Library is capable of even more: you can set up a TCP server, turn the ESP8266 into an access point, for example. Load up one of the other examples in the library to give these other features a try. The ESP8266 works great and it's cheap, but it can be so much more than a simple AT-command-driven serial-to-WiFi gateway! It can be reprogrammed just like any microcontroller, and you can even load Arduino sketches onto it. Danger zone! Uploading new code to the ESP8266 will overwrite the AT command firmware it ships with. You can always put that firmware back on, but the AT library probably won't work with whatever custom code you load onto the ESP8266. This section is included with this tutorial, in case anyone wants to use the ESP8266 WiFi Shield as more of a general purpose ESP8266 development board. You can skip it if you intend on using the Shield as an actual Arduino Shield. To load code onto the ESP8266 WiFi Shield, you'll need a couple extra bits of hardware: a 5V FTDI Basic and a wire. Actually, any device that can translate computer-speak (either USB or RS-232) to TTL serial could work (see the old RS232 Shifter), but the FTDI Basic and it's FTDI Cable counterpart work best, as they mate directly with the ESP8266 WiFi Shield's programming header. You'll also need a jumper wire to easily connect and disconnect GPIO0 from GND. GPIO0 controls the ESP8266's run mode -- if it's LOW (0V, GND) when the chip boots up, it starts up its bootloader. If GPIO0 is high on bootup, it'll begin running its application code. There is a pull-up resistor attached to GPIO0, so all you should need to do is pull it to GND when uploading code and leave it floating otherwise. There are a variety of ways to achieve this connection, the easiest of which may be running a male-to-male jumper wire between female headers. If you're going to be doing a lot of code uploads, perhaps you'll want to set up a switch between GND and floating. 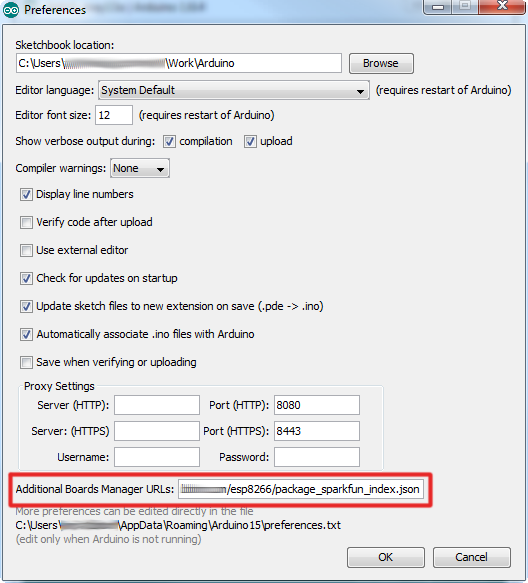 Hit OK. Then navigate to the Board Manager by going to Tools > Boards > Boards Manager. There should be a couple new entries in addition to the standard Arduino boards. 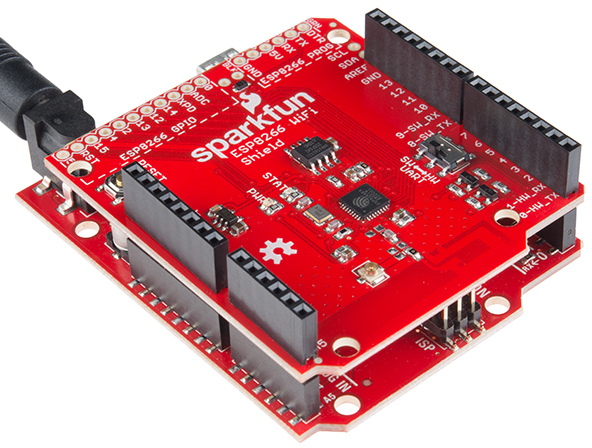 Look for SparkFun ESP8266 Development Boards. Click on that entry, then select Install. 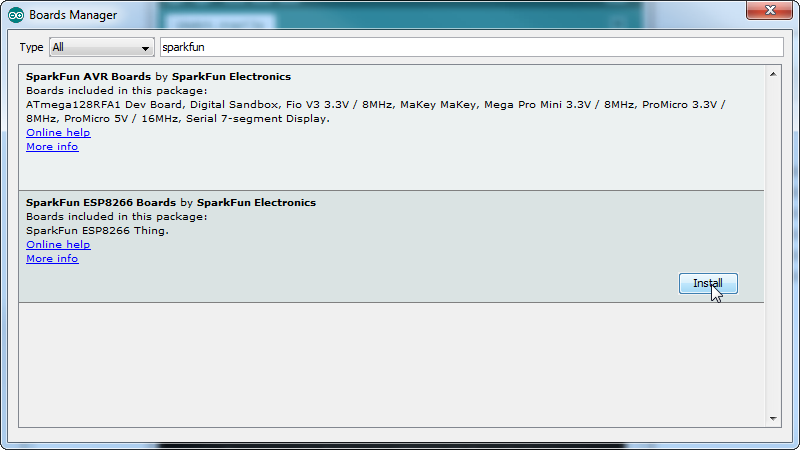 With the Board addon installed, all that's left to do is select the proper board from the Tools > Boards menu. Under that menu, find "SparkFun ESP8266 Thing" and select that. Now that you've got the environment set up, it's time to upload some code. If you're using an FTDI Basic to upload code, you can also use that board to power the WiFi Shield. Remove the Shield from your Arduino, plug in the FTDI cable, and the power LED should illuminate. Load up a simple blink sketch -- setting the blink pin to 5 (attached to the Shield's STAT LED). Don't forget, when you upload a sketch to the ESP8266, to make sure GPIO0 is connected to GND. Viola! You're on your way to being an ESP8266 developer! For more guidance on ESP8266 development, check out our ESP8266 Thing Hookup Guide, notably the sections starting around the example sketches. With it's deep sleep ability, the Thing is a great foundation for a WiFi-based weather station, or a friendly, huggable, interactive plushy.